Having turned every bolt in this 510 of mine, it's only appropriate that I'll encounter every kind of leak possible from the engine bay. Last month, it was engine oil, gear oil, and coolant. Today, it's more coolant and hydraulic fluid. On the bright side, my engine runs quite nicely at the moment. This weekend, I got all the wiring plugged in (which amounts to the wires to the distributor, and the wires to the alternator), and after spraying a spritz of carb cleaner down the SU throats, it kicked right over. I didn't leave it running for any longer than the single spray of carb cleaner, since I didn't have coolant in the radiator, nor any gear oil in the transmission. I just needed to make sure I had it wired up properly. As it turned out, the leak from the water pump wasn't from a break in the gasket. At least, not in the way I thought. I compared my water pump to the one on a spare L18 I have sitting in my garage, and I guess there's a dowel that sticks out of the front cover and into the water pump... and my front cover doesn't have one. I previously had that hole plugged up with some gasket sealant, and since I didn't feel like yanking the water pump again, I just filled the hole with some JB-Weld. Yes, this isn't a good solution if I plan to reuse this water pump on another L-series motor, but since I don't have any such intention, this will do. In other news, I took a closer look at my SU air cleaners to try to get them cleaned up, and I found that I couldn't pry the cleaners of their mounts. I unbolted the filter assembly from the carbs, and it turns out that they're actually velocity stacks, and it was the air horns that prevented the cleaners from coming off. Fun. I've been meaning to pick up some velocity stacks for my carbs. Now I don't have to. I've had the crankcase venting out to atmosphere for a while, and finally got around to picking up a hose long enough to reach the PCV valve on the intake manifold. I also picked up some more gear oil to replace what I dumped out on my garage floor last month. Yesterday, I ran the engine after filling up the radiator, and I saw a spray of fluid coming up from the bay, all over the garage wall. Apparently, the lower radiator hose ended up rubbing up against the alternator, rupturing it and spraying coolant onto the alternator. 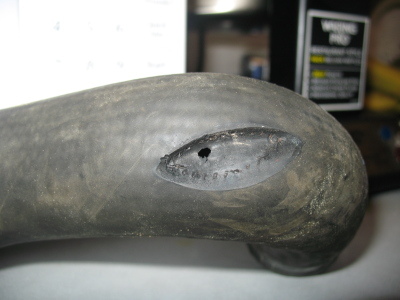 Here's the hole the alternator made in the hose. Yes, quite a mess. I went and picked up a new lower rad flex tube and installed it. To prevent another coolant shower from happening again, I either need to install a metal shield over the hose to protect it from the alternator, or use some kind of tension cord to pull it back. 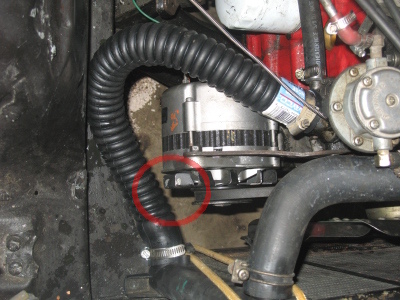 You can see in this picture how close the hose is to the alternator (circled in red). On the bright side, the engine runs very well, and held idle as soon as I got it cranked over. 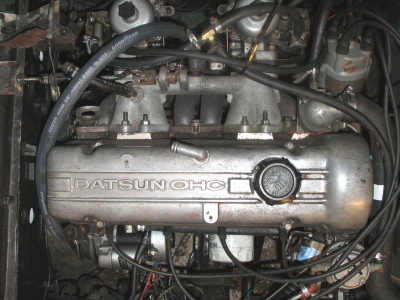 As far as the engine is concerned, all I need to do is fab up a choke cable, and then I'll be good to go. Towards the end of this weekend, I worked on the 510 in the driveway. I bolted up my makeshift exhaust solution (I've got the muffler sticking out on the side of the car, under the driver-side door), and revved it up... and man it purred nicely. It idles a little high, but I can live with that, at least until the choke is hooked up. 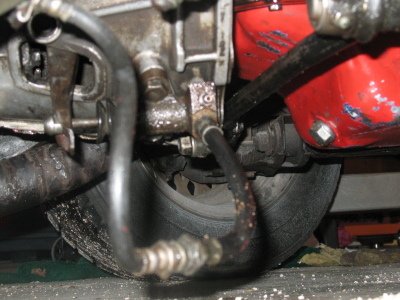 Anyhow, I went to drive the car back into the garage, and noticed that I couldn't get the car into gear -- the shifter arm wouldn't get out of neutral, so I pumped the clutch a few times and got it into gear. However, once it was in gear, the tried to engage the clutch even with my foot on the pedal, causing it to stall out. I tried this a few times, and then suddenly lost pressure in the pedal. I got out and checked under the car, and I apparently blew out my slave cylinder. More fluid on my garage floor. Fortunately, it dribbled onto an existing pile of kitty litter I've got the floor from my last few spills. Not enough play at the clutch pedal. I would bet that the "pushrod" is adjusted too tight. Loosen it up (or the pedal stop itself) and make sure you have at least 1/8" of play in the pedal. Checked the bb-list, and Kelvin (the guy that wrote the original message I found in the archives) is confirming that's my problem. Also, my slave cylinder is probably old enough to need to be replaced anyway, so it's time to buy a new one. Sigh. At least I'm learning everything about my car. That's the positive side of all this, right? UPDATE: Further back and forth on the bluebird mailing list has caused me to reconsider the cause of the problem with my slave cylinder. It appears that the issue may have actually been a leaking cylinder (the ring on the plunger probably ruptured), unrelated to having the plunger "pop out" of the cylinder. The result is the same, though -- I ordered a new slave cylinder and it should arrive by Wednesday.